Adam Thompson scored the only goal of the game as Chesterfield’s long wait for a win away from the Proact continued. The Spireites are without a win away from home since beating Barnsley at Oakwell last season - ten away trips ago. Thompson’s first-half strike separated the two sides on a sunny day at Roots Hall. Manager Danny Wilson made just one change to the side that lost 1-0 to unbeaten Bradford two weeks ago as the Spireites looked to end a run of four games without a win. 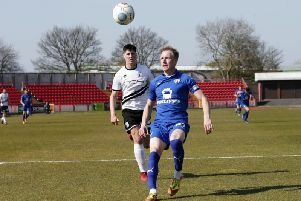 Defender Liam O’Neil returned to the starling line-up for his first appearance since the end of March after undergoing ankle surgery. The Shrimpers were good value for their half-time lead after having much of the better chances before the break. Spireites stopper Ryan Fulton had to be alert to kept Simon Cox’s header out before the striker fired over just minutes later. On the stroke of the half hour mark Thompson found himself in the right place at the right time to net his third goal in Southend colours. Fulton superbly kept Ranger’s header out before a melee in the box fell to the defender who smashed home his first of the season from ten yards. Wilson’s charges sprung into life after going behind. Gboly Ariyibi became a real force down the right with his searing pace as he looked to get the ball in the box. Striker Kristian Dennis forced a top save from Southend’s Mark Oxley, who pushed his sliding shot marginally over the crossbar. On the stroke of the break Fulton produced a fine reaction save to keep the deficit at just the one as he kept out Ranger’s header from point-blank range. A defensive mix-up almost gave the visitors a way back into the game ten minutes after the restart. Dion Donohue’s free-kick found Sam Hird but his header was eventually cleared after a goalmouth scramble. Down the other end Jason Demetriou was sent away in acres of space, only to be denied by Fulton. With 15 minutes left the Spireites almost equalised again, with another frantic scramble keeping them at bay. Young Ricky German had the final effort that was somehow cleared off the line by a hosts’ defender. A beautiful bit of play between Ariyibi, who wonderfully turned his defender, and Gary Liddle put the former in space but he could only fire wide late on. Southend: Oxley, Demetriou, Thompson, Ferdinand, Coker, McLaughlin (McGlashan 69), Leonard, Wordsworth, Atkinson, Cox, Ranger (Fortuńe 78). Unused subs: White, Mooney, King, Smith, Inniss. Chesterfield: Fulton, O’Neil, Hird, Anderson, Donohue, O’Shea (Mitchell 59), Nolan, Liddle, Ariyibi, Dennis (German 59), Wilkinson (Dimaio 82). Unused subs: Evatt, Gardner, Allinson, Graham.